Before cooking, rinse quinoa in a fine mesh strainer. Quinoa kernels are coated with saponins, naturally occurring compounds that protect the plant against insects. A quick rinse removes this bitter tasting layer. Use organic ingredients whenever possible. Depending on the size of the tomatoes, this will serve between 4-6 people. 2 cups water. You can also use chicken or vegetable stock; it provides a great flavor boost. 2. Cut off the top ¼ to ½ inch of the tomato. Using a spoon, scoop the seeds, jelly and flesh from the inside of the tomatoes. If necessary, slice a thin segment from the bottom of the tomato so that it sits upright in the dish. Sprinkle about ¼ teaspoon salt on the inside of the tomato shells, invert them on a paper-towel lined plate and leave them to drain for 30 minutes. This step will help them stand up to the oven’s heat. 3. Rinse the quinoa in a fine mesh strainer and cook according to package directions. 4. In a small bowl, whisk together the ingredients for the dressing. 5. 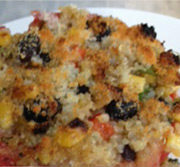 Combine the cooked quinoa, corn, black beans, peppers, cheese and scallions. 7. Stuff the tomatoes with the quinoa mixture and sprinkle with Parmesan cheese. Bake for 20-25 minutes at 375°. Turn the oven to broil and place under the broiler for about a minute. Watch closely! If you turn away, even for a second, it can burn. Often, when planning my weekly menu, I look for foods that can play double duty. Roast a large butternut squash seasoned with cayenne pepper, serving some as a side dish with dinner one night and using the rest the next evening in this delicious main course. 1. Drizzle olive oil over the cubed butternut squash and season with salt, pepper and cayenne. Unless you like things very spicy, use a soft hand with the cayenne pepper. Roast at 400° for about 25-30 minutes, until the edges of the squash are slightly browned. 2. Over medium heat, sauté onions until softened. Add garlic and cook until fragrant, about thirty seconds. Add kale and ¼ cup of vegetable stock. Cover and cook for five minutes. Remove the lid and let the mixture cook, stirring occasionally, until the stock evaporates. Remove from heat and add red wine vinegar. 3. In a bowl, mix together kale mixture, the butternut squash and the black beans. 4. Assemble the tortillas. 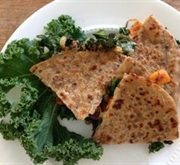 Spread a generous amount of the kale mixture on a tortilla and top with cheese. Add a tortilla on top to complete the quesadilla. 5. Preheat a skillet over medium-high heat. Brush the skillet with olive oil and add the quesadilla. Cook until the bottom of the quesadilla is lightly browned, about 3 minutes. Brush the top of the quesadilla with olive oil and flip it in the pan, cooking for an additional 2-3 minutes. 6. Cut into wedges, serve and enjoy! Tip: To make the butternut squash easier to peel, make several large slits through the skin with the tip of sharp knife. Microwave the squash for 3-5 minutes to soften the skin. Allow it to cool for a minute or two and start peeling. You will be amazed at how much easier the squash is to peel.